It’s not every day you get to see something new for the first time, and as a reviewer, so much better when said new component is in a system that you are actually familiar with. The debut of the Kronos turntable in Montreal just happened to be in a room possessing the same dimensions and orientation of my own, built around a system featuring a pair of Sonus faber Stradivari speakers, all powered by Audio Research Reference components. So much for making the excuse of “needing to hear it in my system!” Kronos designer Louis Desjardins was even using a Lyra Skala cartridge, one of my current references at the time. Many others voted the Kronos room best sound of the Montreal show – and it’s reassuring to see multiple critics agree on what constitutes great sound. I’ve been living with the Kronos turntable for eight months now, so consider this a “long term” review. 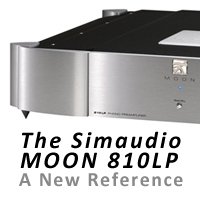 It’s easy for reviewers and audiophiles alike to get caught up in the excitement of a product, either at a dealer or in the fever of a show environment. Clearly everyone was buzzing about the Kronos in Montreal last year, and the other shows the table has been presented. Desjardins has been strategic, not letting just anyone use his table at shows, keeping the exposure limited to fantastic systems. Yet after living with the Kronos for the better part of 2012 and having the chance to use it with multiple tonearms and cartridges, my impression is even better than it was when the audition began. Minimizing my results, the SME arms both lend more weight to the LF spectrum, while the Graham is slightly more nimble, ever so slightly more resolving. However, both are close enough, especially when using the SME V-12, that your choice of cartridge will be the ultimate deciding factor. And neither proved to be a “wrong” choice. The key aspect of the Kronos table is it’s two platters. Other manufacturers have produced tables with more than one platter, but Kronos’ variation on the theme is to rotate their second, identical, 30-pound platter in the opposite direction of the main platter spinning the record. In essence, it completely cancels any vibration induced by the first. Mitsubishi licensed a similar technology to Porsche back in the 1980s for the engine in the 944. This 2.5-liter, straight four-cylinder engine was as smooth as a BMW inline six utilizing a counter rotating shaft opposite the crankshaft to achieve this effect. Due to the plinth size of the Kronos, this table is better suited to 12-inch tonearms. Our review began with the SME 312, with guest appearances by the SME V12 and Graham. The short story here is to buy the best arm you can afford with the Kronos; its astonishingly low noise floor reveals every last molecule of detail the arm is capable of extracting from your cartridge. Feickert’s PlatterSpeed app reveals 33.33 rpm exactly. The Kronos also has a pair of LED readouts, monitoring the speed of both platters and it tracked perfectly with the Feickert measurements. 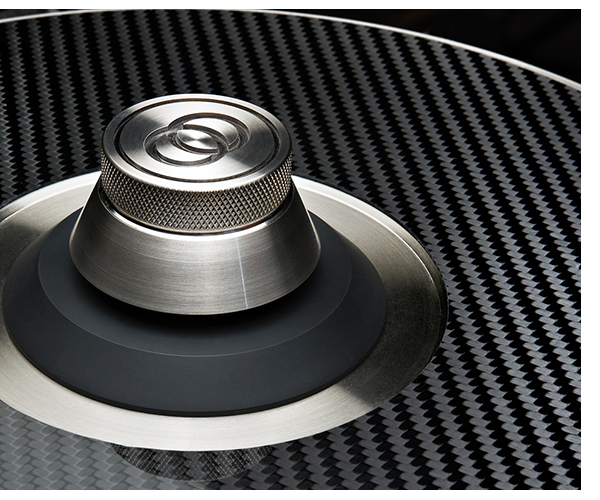 The aluminum top platter has a carbon fiber inlay and no mat is needed. The rock solid speed accuracy of the Kronos is immediately noticeable, playing Mendelssohn’s Violin Concerto in E minor, Op.64. This instrument is tough to get right and on lesser tables devolves into a screechy mess. The first 30 seconds of this piece right before the orchestra joins in, is so delicate, yet a joy to hear rendered by the Kronos, all of its subtle overtones gracefully intact. The long synthesizer sustain at the beginning of Triumvirat’s “The Capital of Power” reveals the same thing. On a budget table, the synth warbles like a cassette that’s been left in the sun too long, yet here an unmistakable richness comes through. This combination of speed accuracy and the 12-inch tonearm, makes it easy to fool yourself that perhaps you are listening to a reel to reel tape, or a linear tracking arm. The usual crew of analog fans that stop by to check out the latest gear all made similar comments, and even those outside the fringe, commented about “how real” the music sounds played on the Kronos. The Kronos integrates inner detail with wide dynamic swings. The only other table in the studio with a 12-inch tonearm is the AMG V-12; so comparing the two is not a direct “apples to apples” comparison. 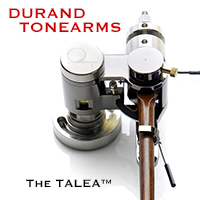 24/192 digital samples (via the Nagra LB recorder) confirm the benefit of the longer tonearm, yet the Kronos has an unmistakable sonic signature, even when captured to high-resolution digital files. 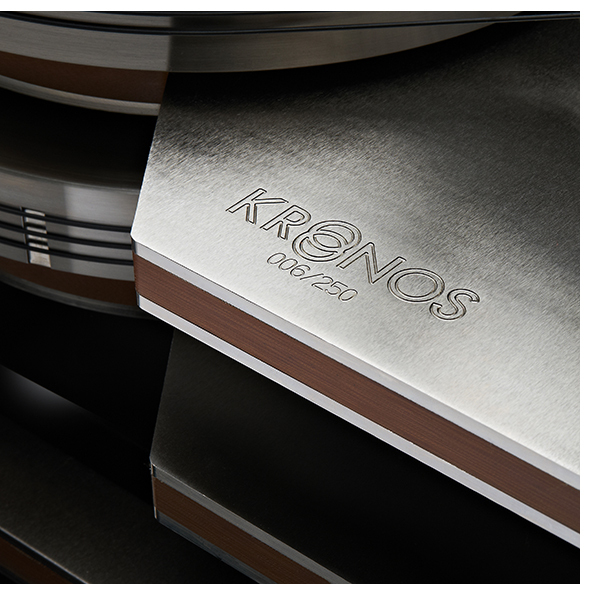 On a certain level, the Kronos is not unlike the $150,000 Continuum turntable in its rock solid bass stability and texture resolution. Auditioning highly familiar LPs with bass heavy grooves instantly unearths just how special this turntable is. Even the heartbeat at the beginning of Dark Side of the Moon, is more visceral, has more dimension and subtlety than before. The opening bass riff of Led Zeppelin’s “Dazed and Confused,” utterly fantastic, you can almost feel the grille cloth rattling on John Paul Jones’ bass cabinets. This is not limited just to the bass. Acoustic instruments take on more charm via the Kronos too. Those loving female vocals will be in heaven. The transition as Betty Davis’ goes from bedroom whisper to bar room growl in “Bar Hoppin” is seamless. I suppose you could listen to Eva Cassidy, nah. Male vocals are equally exciting. However, the fine detail that this table exposes is its greatest strength. Tracking through Eno’s Here Come the Warm Jets unearths an abundance of buried treasure, especially on the track “Dead Finks Don’t Talk.” Re-assessing a cache of densely packed records opens up recordings that felt overly compressed, again proving how much information is really packed in those fine grooves. I’ve always felt that a great hifi system should expand your music collection, not limit it to a handful of audiophile darlings that always seem to be stuck to the platter. Much like the AVID Acutus REF SP, the Kronos’ ability to disperse the music buried in the grooves more evenly, makes records that might have been passed off as not worthy of your system much more palatable. 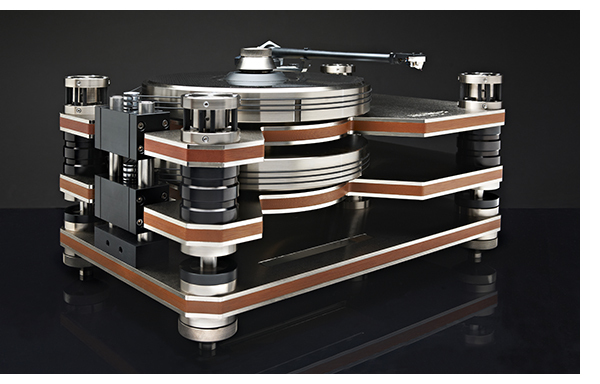 Resolution without fatigue is the essence of the Kronos turntable. Even my awful copy of Boston’s Don’t Look Back sounds pretty darn good. 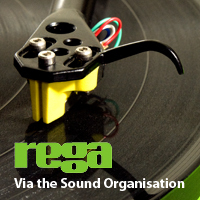 Imagine what the best pressings in your collection will sound like. It’s better than that. 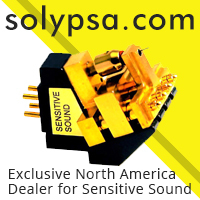 All this quiet makes the Kronos a perfect place to test-drive premium phono cartridges. With the Lyra Titan-I, Atlas and Clearaudio Goldfinger at hand, (and the Nagra LB close by) it was time to up the ante. All three of these mega dollar cartridges perform flawlessly in concert with the Kronos, though I would suggest the SME V-12, Graham or something equally magnificent. The 312 is a great way to enjoy the Kronos, and works well with a wide range of cartridges, but if you are going for a cost no object cart, I feel you might be leaving a bit of resolution at the door with the 312. The Kronos weighs 90 pounds when you remove the parts from the neatly packed, aluminum flight case. The box was so compact, that when it arrived, we initially thought they forgot to ship something. High marks to Kronos for shipping their table in such a compact, yet robust case – it’s a definite value add. With three separate sub plinths, two motors, a motor controller and of course those two 30 pound platters, I expected setup to take all day, yet designer Desjardins had the Kronos ready to roll in under 45 minutes, with the Sumiko cartridge nearly optimized to perfection. A few test tracks later, it was fully dialed in and we went to lunch. The Burmester equipment racks in the TONEAudio studio are not the last word in vibration control, but they are overbuilt, supporting heavy gear with ease. Because of this, they are particularly handy at seeing how well a turntable’s suspension does at filtering out ambient vibration. Even when pounding on the top shelf, the Kronos stops the vibration from getting through to the speakers – highly impressive. Utilizing a pair of ultra high quality Swiss DC motors, the Kronos table makes use of a small external power supply connected via two cables. A three-pin cable transmits the DC power, and the other; a four-pin cable transmits data, making it impossible to connect things improperly. One of the many small details that makes the Kronos so special. Capacitance sensors power the table on and off, and change the speed, so they will never have to be replaced, and the digital readout is amply sized, making it easy to see what you are spinning! Desjardins claims a one-year interval on lubricating the pulleys and five years on the main bearings, keeping maintenance to a minimum. Every aspect of the Kronos turntable feels over built, with fit and finish equally excellent for what was turntable number two in the eventual production run of 250 units. As Desjardins wrapped his visit this spring, he had already sold 50 tables worldwide since its official introduction in January of 2012 at the Consumer Electronics Show. It will be exciting to see just what he’s got in store for 2013. In the light of other tables from AVID, Clearaudio and SME to name a few, the Kronos is polished and up to task. I award the Kronos one of our nine Publishers Choice awards for 2012 – it remains as enjoyable to listen to as the day it arrived. Here’s to Louis Desjardins’ continued growth and success.